He is one of Australia’s leading eye surgeons, and now NewVision Clinics founder Dr Noel Alpins has been awarded the opportunity to present a distinctive Australian lecture. 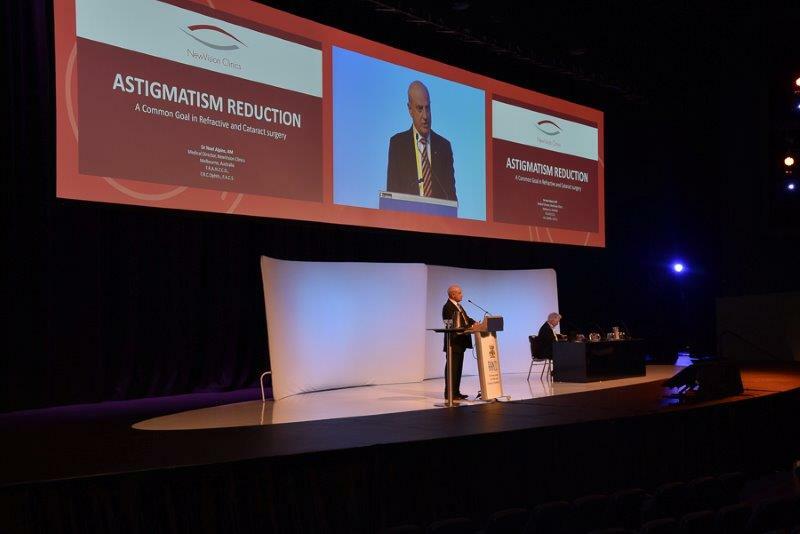 Dr Alpins was an invited guest lecturer at the 49th Annual Scientific Congress of The Royal Australian and New Zealand College of Ophthalmologists (RANZCO), taking place at the Perth Convention and Exhibition Centre in October, where he was asked to present the Sir Norman Gregg Lecture. This opportunity is by invite from the college and one recipient annually only has the opportunity to present the lecture to their ophthalmic colleagues. Dr Alpins earned this privilege after 22 years of surgical experience which has seen him develop new techniques and methods for the treatment of astigmatism that are now being adopted worldwide. “The Sir Norman Gregg Lecture is a once-a-year presentation at the annual scientific conference by a speaker who has made innovative and significant contributions to ophthalmology,” he said. Dr Alpins spoke on three key points in his lecture. The first discussion point was his new method for measuring astigmatism, which is more effective than previous techniques. Dr Alpins released a research paper on A New Method of Quantifying Corneal Topographic Astigmatism CorT in 2012, before developing a more advanced technique for total corneal power in 2015. He explained how this technique is more reliable than previous measures because it eliminates much of the variability. In treating astigmatism through surgery, Dr Alpins said that glasses—rather than the corneal shape—were most often used as the primary basis for measurements for treatment. Which is why he developed Vector Planning®, so he could actually combine the corneal shape with the spectacle parameters. It is the corneal shape that is the primary cause of any astigmatism. “Vector Planning® brings the corneal shape into the treatment plan and it eliminates the anomaly between the differing corneal shape and the spectacles so that one paradigm can operate effectively. “By doing that, we end up with less astigmatism on the cornea and consequently better vision. Dr Alpins also discussed his publication in cataract and refractive surgery journals, which have set the standard for analysing astigmatism for all other international submissions when examining astigmatic outcomes. Dr Alpins has published scientific papers in international journals since then. His methods of astigmatism analysis are now the benchmark for authors who need to be followed by other authors who submit scientific research for publication. Contact NewVision Clinics on 1800 20 20 20 to begin your journey towards excellent vision.